GTO-125 Size: 16 fl. oz. GTO-150 Size: 32 fl. oz. The most popular teak oil used by boaters to preserve and beautify teak to a warm golden color. Surrounds wood fibers deep below the surface to lock out moisture, maintaining the woods natural integrity. Left un-oiled, over time teak will dry out, check and crack. Amazon’s Golden Teak Oil, blended with the world’s finest oils, and has been the choice of boaters since 1978 to safeguard teakwood’s beauty. 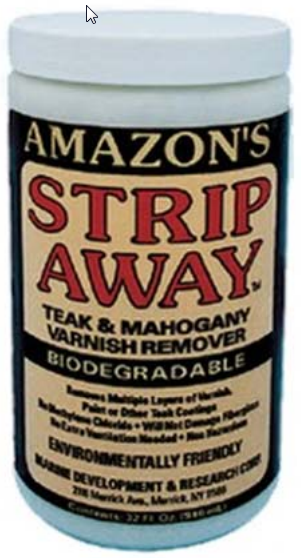 Non-flammable as with all of Amazon’s oils, environmentally friendly, biodegradable and easy to apply keeps Amazon’s the No. 1 choice of Teak oils. Teak Prep 8 fl. oz. Golden Teak Oil 16 fl. oz. One Step Teak Cleaner 16 fl. oz. 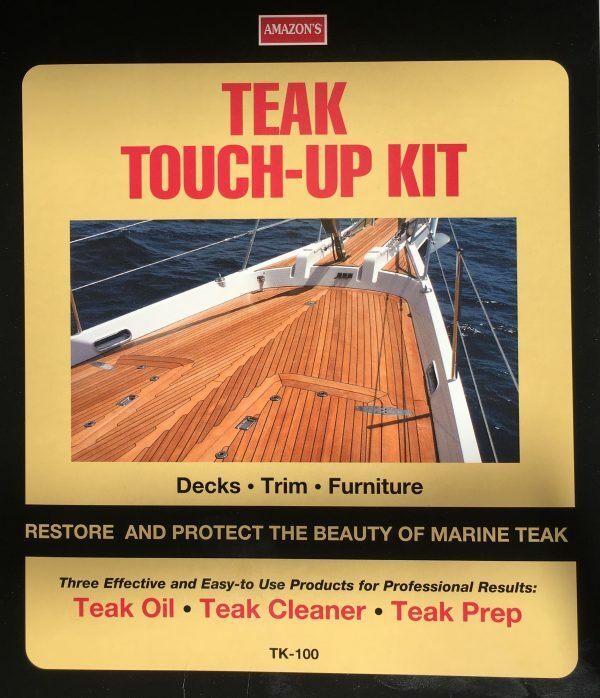 The Teak Touch-up Kit includes three of Amazon’s well known teak maintenance products that for many years have serviced the marine industry. 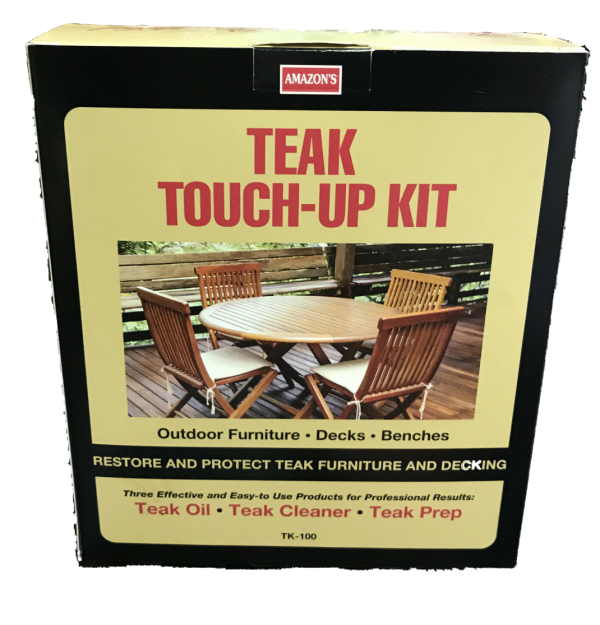 The kit contains the essential products necessary to totally renew those smaller teak appointments or to restore a section of a larger teak area. TK-100 contains 16 oz. 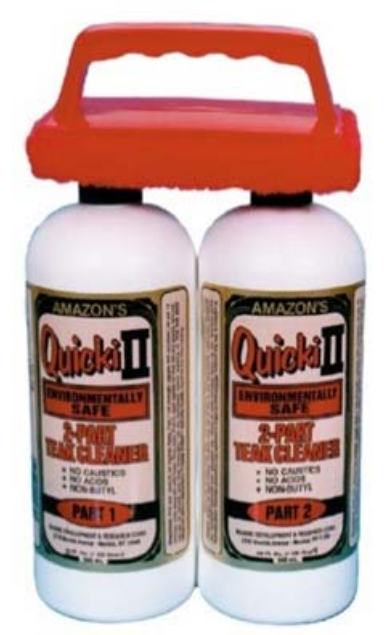 bottles of One Step Teak Cleaner, Golden Teak Oil and an 8 oz. bottle of Teak Prep. All three combine to give that professional looking give that professional looking result. No need to purchase larger sizes of product when Amazon’s Touch-up Kit includes just the right amount of each to tackle the smaller teak maintenance jobs. Easy appreciation with directions for each step included on the label of each bottle. GO AHEAD, SHOW OFF YOUR TEAK! LE-825 Size: 16 fl. oz. LE-850 Size: 32 fl. oz. Formulated to replace all of the teak’s natural oils without changing or darkening the surface color. Slightly lower viscosity to penetrate quickly into the woods pores. Also excellent for lighter wood’s such as Oak and Maple. Easy wipe on application. TP-925 Size: 16 fl. oz. TP-950 Size: 32 fl. oz. Used by the “Pros” to remove hidden moisture from below the teak’s surface this could cause the oiled teak to turn black. Also evaporates any remaining cleaning chemicals that could cause white spots after oiling. Easy to apply. Why chance these undetectable problems when Teak Prep is available. QU-100 Size: 2 x 32 fl. oz. TC-250 Size: 32 fl. oz. TO-425 Size: 16 fl. oz. 100% natural Tung oil for the ultimate in wood preservation and enhancement. Higher viscosity seals the woods surface while maintaining the beauty of the grain. Used by fine furniture builders the world over…even on the most exotic woods. Easy wipe on application. Easily and safely removes varnish, teak coatings, even paint from wood surfaces. Environmentally friendly. NO METHYLENE CHLORIDE or MEK, will not damage wood or fiberglass. No odor or hazardous fumes. Water based formula, easily applied by brush or roller and clean-up with water. Great for removing boat names or graphics. SA-925 Size: 32 fl. oz. LO-325 Size: 16 fl. oz. The natural cleaning properties of pure lemon oil, blended with the finest preserving oils, will enhance the luster of fine wood furniture, galley cabinets, bulkhead paneling, etc. Treat your wood to a 100% blend of natural oils without perfumes, spirits or waxes. Easy wipe on application.